Alpena This building was constructed in 1876 for Samuel E. Hitchcock and his wife, Samantha Hitchcock, two of the first settlers and most prominent citizens of the city of Alpena. In 1901 it was sold to the local chapter of the Independent Order of Odd Fellows (I.O.O.F. Alpena Lodge No. 170). Leer The Norwegian Lutheran Church Complex includes a church, parish house, cemetery, and pavilion. The church is substantially the same as when it was built in 1899. Highlights include an altar painting by Sarah Kirkeberg Raugland, and an unusual pressed metal interior in the parish house. Alpena Township The SS Pewabic was a package freighter that served ports on the Upper Great Lakes. She was launched in October 1863, fitted out in the spring of 1864, and was in active service until she sank off Thunder Bay Island in Lake Huron on August 9, 1865, due to collision with her sister vessel. Bellaire The Antrim County Courthouse was designed in 1879, but construction did not begin until 1904. 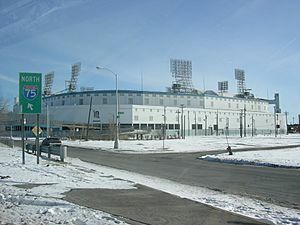 A new facility was constructed in 1977/78, and this building was vacant until restoration in 1990–92. As of 2014, it houses the Antrim County courts and prosecuting attorney. Elk Rapids The former Elk Rapids First Methodist Episcopal Church was constructed in 1901 and served the congregation until 2011. It is significant in part due to its distinctive Gothic stained glass windows. The building now houses Elk Rapids Area Historical Museum. Bellaire The M-88–Intermediate River Bridge is a steel stringer bridge, constructed in 1931–32, with many workers provided by the Depression-era County Relief Committee. Hastings The Barry County Courthouse, designed by Albert E. French, was constructed in 1892–94. The design of the building is eclectic, combining Late Victorian, Queen Anne, and Richardsonian Romanesque elements. Hastings The Shriner-Ketcham House was constructed in 1868 by local dairy owner and farmer William Shriner. John C. Ketcham, a six-term U.S. Representative, purchased the house from Shriner, and lived there until his death in 1941. Beulah The Benzie County Courthouse was constructed in 1912 as a recreation center and hotel, named The Grand. In early 1916, Beulah won an election to become the county seat of Benzie County, and the former hotel was converted into a courthouse. Frankfort The house was constructed by the Frankfort Land Company in the 1860s to provide a residence for company officials living on site. However, the existence of the house - the first stylish building constructed in the town - also advertised the confidence the Land Company had in the potential and economic vitality of Frankfort. It currently operates as the Stonewall Inn B & B, a bed and breakfast. Frankfort The Navigation Structures at Frankfort Harbor consist of a pair of piers and a pair of breakwaters. The piers, built in 1867–73, have been substantially modified over time, including being significantly shortened after the 1932 completion of the breakwaters. Dowagiac The Criffield–Whiteley House, constructed in 1897, is a 2-1/2-story Queen Anne house sitting on a rubble fieldstone foundation which is made from large, carefully fitted pieces. Pokagon Township In 1876, this building was converted from a hop barn into a church. It is significant as the 1903 location of the first performance of George Bennard's hymn "The Old Rugged Cross." 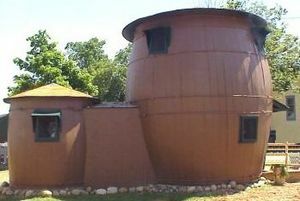 In 1914, it was sold and converted back to storage; restoration began in 1998. Marcellus This house is a two-story structure with both Dutch Colonial Revival and Romanesque Revival elements. It was built for Carroll Sherman Jones, the son of Marcellus founder George Washington Jones, and his wife Bessie between 1898 and 1900 from a design by the Detroit architectural firm of Alan C. Varney. Clare The Clare Congregational Church (now the Clare Congregational United Church of Christ) was built in 1908–09, and is one of the few churches in Michigan that reflect the architectural adoption by early twentieth-century Protestants of the Early Christian central plan churches of the fifth- and sixth-century. Clare The Clare Downtown Historic District is located in the commercial center of the city, along four blocks of North McEwan Street with adjacent portions of East and West Fourth and Fifth Streets. There are 51 buildings in the district, constructed from 1873 to 2000. 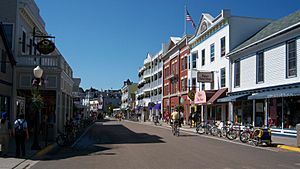 Most are two stories, and represent Neoclassical and Commercial Brick, with some Late Victorian, Mid-century modern, and later 20th century architectural styles. Duplain Township This site consists of three structures: theUpton Road Bridge, one of only three remaining Parker truss bridges in Michigan, the Elsie Mill Pond Dam, a rock and earth-filled dam with a concrete cap, and Kellogg Bros. & Johnson Mill Site, the foundation and associated remains of the 1865 Kellogg Bros. & Johnson grist mill. Iron Mountain The Chapin Mine Steam Pump Engine, also known as The Cornish Pump, was built by the E. P. Allis Company (now Allis-Chalmers) in 1890–91, and is still the largest reciprocating steam-driven engine ever built in the United States. It was use in the 1890s at the Chapin Mine "D" shaft, and from 1907 to 1914 at the nearby Ludington Mine "C" shaft. At the "C" shaft, the engine was connected to a series of eight pumps, the deepest of which was 1,500 feet (460 m) below ground. The total capacity of the pump system was 3,400 US gallons (13,000 l) per minute. The system was replaced in 1914 by electric pumps, and the Cornish Pump has served as a tourist attraction since 1934. Iron Mountain The Dickinson County Courthouse and Jail was built in 1896. It is a rock faced red brick Romanesque Revival-style structure designed by architect James E. Clancy of Antigo, Wisconsin. Iron Mountain This district covers the city's central business district and adjacent areas It is primarily commercial, but also contains the historic county courthouse complex, and school, library, and church buildings. Breitung Township This highway bridge between Dickinson County, Michigan and Florence County, Wisconsin was built in 1910–11 because the Twin Falls Power Dam would soon flood the previous bridge. It is one of two pin-connected, camelback, through-truss bridges remaining in Wisconsin. 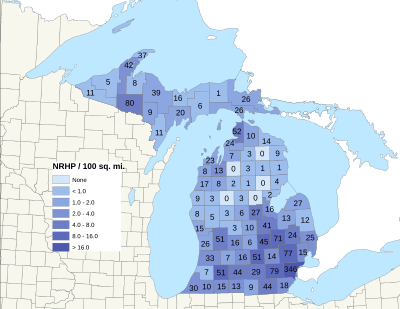 Site of liquor inspections from 1914 to 1920, when Michigan was dry and Wisconsin wet. Jonesville The J.J. Deal and Son Carriage Factory was built in portions over the span of 1893–1909. The company produced multiple models of the Deal Automobile here from 1908 to 1911, but went out of business in 1915. It was later used by the Kiddie Brush & Toy Company. As of 2016 it houses the Heritage Lane Apartments. Jonesville Grace Episcopal Church is a 1-1/2 story rectangular Greek Revival frame structure covered in clapboard. Built in 1844–48, it is one of the first church buildings constructed in Michigan west of Detroit, and is one of the few surviving examples of indigenous church architecture in the state. Hillsdale The Hillsdale County Courthouse is the third permanent county building located at this site. The yellow sandstone courthouse was built in 1898–99 from a design by Jackson architect Claire Allen. Oscoda The Five Channels Dam Archeological District encompasses the site of the former worker's camp, used during dam construction in 1911–1912. At the completion of dam construction, the worker's camp buildings were moved to the next construction site (the Loud Dam) or razed. East Tawas The Tawas Point Light was originally constructed in 1852–53. However, the structure began to degrade, and a new lighthouse was built in 1876 at a cost of $30,000. The tower is 70 feet (21 m) tall including the base, with a diameter at base of 16 feet (4.9 m) and a diameter at parapet of 9 feet 6 inches (2.90 m) It is constructed of a brick outer wall, and an inner wall: 24 inches/8 inches thick, respectively. There is an air space between walls of 24 inches (610 mm). Mount Pleasant The Michigan Condensed Milk Factory (owned by the Borden family) was constructed in 1908 and used as a creamery until 1960. After laying vacant for 40 years, it was refurbished in 2003–2009, and now houses the offices of the City of Mount Pleasant. Mount Pleasant The Mount Pleasant Downtown Historic District is centered on the intersection of Broadway and Main in Mount Pleasant, and encompasses the surrounding eight blocks of commercial buildings. 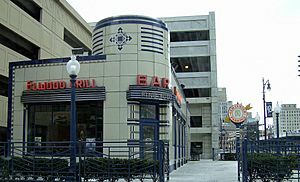 The district contains 70 buildings dating from the 1870s to the 1950s, primarily brick commercial structures of one or two stories representing Commercial brick, with some Late Victorian, Italianate, Art Deco, and International Style architecture. Sherman City The Sherman City Union Church was built in 1871 as the "Guard of American Revolution Hall," and in 1898 was refitted as a nondenominational church. The church was abandoned in about 1960, but was rescued and refurbished in 1977–78 by local citizens. 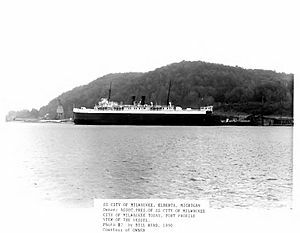 Ludington The SS Badger is a coal-fired ferry carrying both passengers and vehicles. The ship has operated in Lake Michigan since 1953, and is the only remaining coal-fired passenger vessel operating on the Great Lakes. The Badger was originally built as a rail car ferry, but in 1991–92 was refit to exclusively carry passengers and automobiles. She was designated a National Historic Landmark in 2016. Ludington This house was built in 1905 for local businessman and politician Warren Antoine Cartier. Ludington The first life-saving station at Ludington. was built in 1883. In 1933, the original station was moved to become a private residence, and the set of building currently at the site were constructed. In 2003, ground was broken on a new station nearby, and the Coast Guard moved into this building the next year. Ludington The Mason County Courthouse was built in 1893–94, and is the fourth structure to serve as a courthouse for Mason County. It is a Richardsonian Romanesque structure built of Jacobsville sandstone from Houghton County. Wheatland Township The Morgan West Wheatland Cemetery was established in 1864, as African American settlers began migrating to Isabella, Mecosta, and Montcalm Counties. It contains over 50 nineteenth century burial plots, and is still in use today. Hart The Hart Downtown Historic District encompasses the central business district of the city. Structures in the district are primarily commercial, but include single family homes and government building as well. The buildings are predominantly one or two stories, and use a variety of construction materials, of which brick and block are most common. Architectural styles include Italianate, Art Moderne and Mid-Century Modern. Mio The Oscoda County Courthouse was built in 1888–89 at a cost of about $3800 by George E. Hunter from a Classical Revival design by architects Pratt and Koeppe. Unlike the stone and brick courthouses commonly built at the time, the Oscoda County Courthouse is a modest wood frame building, originally sided with wooden clapboards. The building is fronted by a projected bay topped with a hip-roofed steeple. One-story wings extend from both sides of the courthouse. Gaylord Frank Kramer was a Russian Jewish immigrant who settled in Gaylord and began a clothing and dry goods business known as "Kramer's Busy Big Store." He and his wife Rae built this house in 1896. Gaylord James Quick was a prominent citizen of Gaylord. He built this house in 1900. In 1921, dentist Charles Saunders purchased the house, and practiced out of it for a time. Saunders lived here until 1970, and his widow lived in the house until 1999. Germfask Township The Michigan State Highway Department developed standard plans for long-span concrete through girder bridges with arched girders on cantilevered brackets in 1921–22. An early version of this type of bridge was the 90 foot span, designated Bridge Number 750 02, built in 1923 for the Germfask crossing of the Manistique River. Escanaba vicinity An archaeological site which is part of the Woodland Period Archaeological Sites of the Indian River and Fishdam River Basins MPS. South Haven This Greek Revival farmhouse was built in 1853–1858 by Liberty Hyde Bailey Sr; in 1858, Liberty Hyde Bailey was born in this house. The younger Bailey spent 19 years living here, learning about the local wild animals and plants, before entering Michigan Agricultural College (now Michigan State University) and going on to become a well-known horticulturist, botanist and cofounder of the American Society for Horticultural Science. Paw Paw This Greek Revival structure was built in 1842–1845 as the first Van Buren County Courthouse, a function it served for over 50 years. In 1900, it was moved from the courthouse site to its present location, and now serves as the Paw Paw City Hall. Cadillac Cobbs & Mitchell was among the largest lumbering firms in Michigan, at its high point, using 100,000 feet of raw lumber daily. In 1905, Cobbs & Mitchell hired George D. Mason of Detroit to design this brick and limestone building as a showplace for their products. The building is finished throughout using nine varieties of wood native to Michigan: elm, white maple, bird's-eye maple, sap birch, red birch, curly red birch, red beech, red oak and hemlock. Cadillac The Cadillac Masonic Temple, built in 1899, is a three-story Romanesque brick and stone commercial building measuring 75 feet (23 m) by 100 feet (30 m). Cadillac In 1874, Cadillac founder George Mitchell built this house in the Second Empire style, including ornate carved woodwork inside and a mansard roof outside. Mitchell lived there until 1878; in 1922, his great-nephew Charles T. Mitchell purchased the house, and in 1926, completely renovated it to reflect the then-current Prairie School trend in architecture. 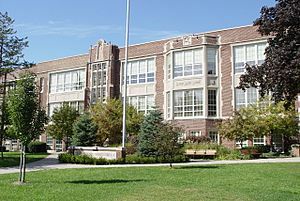 National Register of Historic Places listings in Michigan Facts for Kids. Kiddle Encyclopedia.